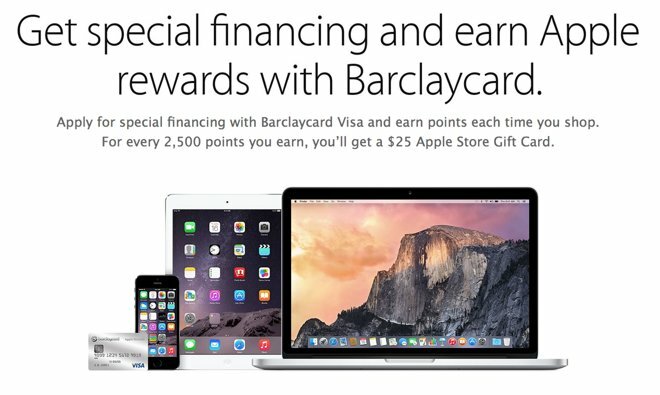 A new "Apple Rewards" Visa card launched this month by Barclaycard with a number of changes, most notably a revised rewards system that pays out Apple Store gift cards, as well as the addition of Chip & PIN security. The new Apple Rewards card offers three points per dollar spent at the Apple Store, two for restaurants, and one point per dollar on all other purchases. Once a user has reached 2,500 points, they receive a $25 Apple Store Gift Card. The card also offers customers the ability to finance purchases made through Apple within the first 30 days of opening account. Purchases under $498 can be financed for 6 months, under $998 for 12 months, and $999 and over for 18 months. The previous Apple card paid out rewards as iTunes gift cards, but the new card gives Apple Store cards. The card should also be compatible with Apple Pay, as both Visa and Barclaycard are participating partners. For customers who shop at the Apple Store frequently, the new card is an improvement from the previous Barclaycard with iTunes Rewards. That card offered two iTunes points for every dollar spent at any Apple Store or the iTunes Store, and one iTunes point for every dollar spent elsewhere. The old Apple-branded card also had a payout level of 2,500 points, which would award customers a $25 iTunes Gift Card rather than an Apple Store card. But reaching that threshold would be more difficult for many customers without the triple points option. However, the fine print of the new Apple Rewards card notes that unlike with its predecessor, iTunes purchases are not qualifying Apple purchases. For customers who spend a considerable amount of money on the App Store or iTunes Store, that could diminish the value of the new card considerably. Apple's new Barclaycard includes an embedded EMV chip that is compliant with Chip & PIN security. Interestingly, it's not a "Chip & Signature" card, which is the more common option in the U.S.